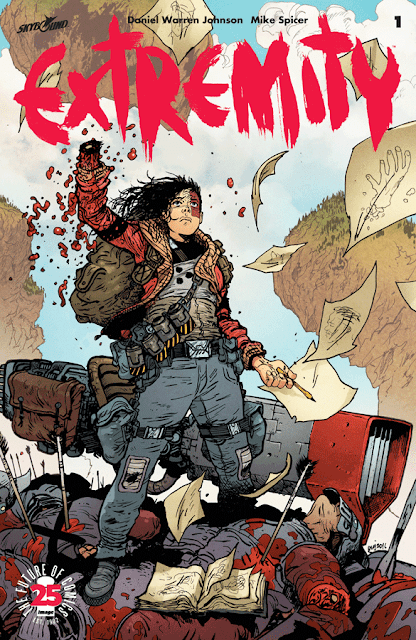 'Extremity' #1 is a violent revenge story and a coming-of-age tale amid the brutality of war. Daniel Warren Johnson and Mike Spicer have created an engaging and explosive new series that doesn't shy away from the horrors of combat and the effects on families both physically and mentally. This is a great sci-fi dystopian comic with a melancholy center. The comparison to Mad Max is accurate but it takes on another level of parallels. It may not be intended to echo the tragedies of the real world but I found some resemblance to the struggles of refugees from war-torn areas. Thea's life is forever changed when the opposing faction attacked her home as a child. Now as a hardened child-soldier she must step up and join the fight to avenge her family. A childhood turned upside-down forced to grow up faster and further removed from the peace and serenity of simple pleasures like creating art. An assault in retribution is bloody and cruel but Johnson has the talent of Chris Burnham or Frank Quietly to fill the panels with great detail and a cinematic eye. He gives Spicer plenty of opportunities to find varying hues of blood as more than one extremity is lost during the battles. It's a sobering yet exhilarating sequence of violence that weighs heavy with serious consequences for those captured. With an equally heavy heart, Thea's soul is cast with the transition from girl to warrior right before our eyes. 'Extremity' #1 makes a thunderous debut with a straightforward revenge action thriller with plenty of heart. A character-driven sci-fi story with magnificent art that makes this new series pull list-worthy. Daniel Warren Johnson has arrived.